All mums agree that ‘A happy baby equates a happy Mum’. At Molfix Diapers, we believe that babies are the leaders of tomorrow and keeping them happy and free goes a long way in fostering their development. Our diapers guarantee these and so much more because of its anatomic structure and other features. So, be a smart mum by using the right diapers! 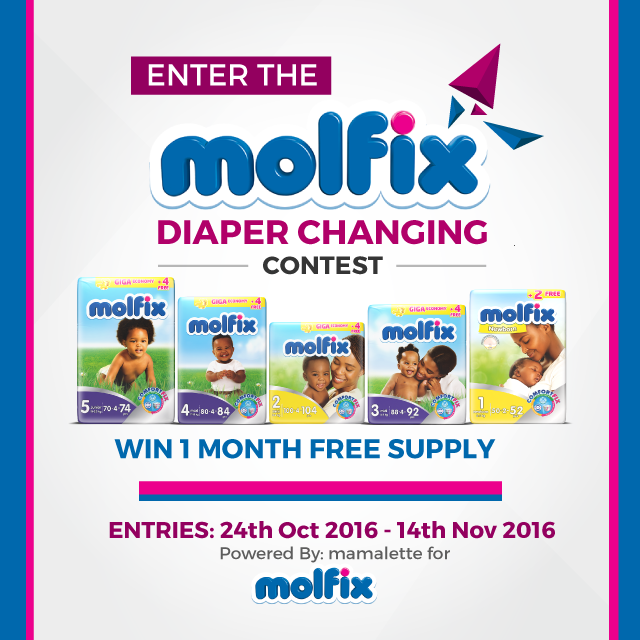 Get Molfix diapers for your precious babies now and join the Molfix family. To reward you for purchasing and using Molfix diapers for your child, we have an exciting competition where winners would win 1 month worth supply of Molfix diapers. We would like you to fill this survey https://goo.gl/forms/aM7DRFVG4sYCrjXs1 first and share why you love Molfix diapers on your baby(ies) with other new and expectant mothers.